Founded in 1988, AccuBilt, Inc. is a systems integrator providing complete automation integration services, including design, build, installation and support of automated welding and production equipment. Specializing in precision built robotic and dedicated automation systems for welding, assembly, material handling and automation support. Our modern manufacturing facility located in Jackson, Michigan houses a complete machine shop, assembly, fabrication, paint, design and electrical departments, as well as a complete 24-hour service department. 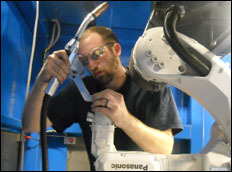 AccuBilt is an experienced turn-key systems builder and integrator of flexible, dedicated and resistance welding, complex material handling and automated assembly and test systems. We are highly skilled in fixture design and manufacturing. We offer highly efficient flexible robotic welding systems such as our Mini-Shuttle™ and Accu-Shuttle™ twin table shuttle systems with standardized pre-engineered cells. These systems are popular and cost effective solutions. AccuBilt partners with each customer to ensure exemplary service, from the initial contact through needs analysis, design, production, test runs, in-house training and follow-up service with a highly trained staff capable of supporting all of the above. "To specialize in the integration of the highest quality automated assembly systems with a focus on meeting or exceeding our customer expectations, while recognizing the value of each of our team member's contribution to the Company's success."